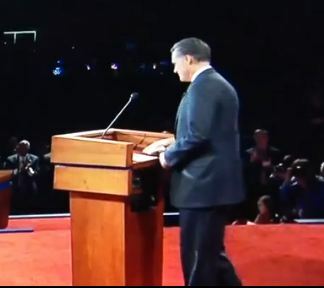 You may be aware of a video making the rounds, in which you will see Mitt Romney clearly slipping a piece of paper out of his pocket, and putting it on the podium. Accompanying this video are statements that it must surely be against the rules to bring notes. Is it against the rules to bring notes? What about paper? WhoWhatWhy checked it out. The website for the Commission on Presidential Debates does not list rules, and so far the Commission has not replied to an inquiry from us requesting those rules. Unless and until the Commission comes forward and tells us what instructions the debate participants are given of what they may and may not do, we cannot be sure whether Romney would be in violation of any terms. However, we may take some guidance from the 2004 agreement between the Commission and the Bush and Kerry campaigns, which was leaked and published on the web, may give us the answer. 5. Rules Applicable to All Debates. (d): Notwithstanding subparagraph 5 (c), the candidates may take notes during the debate on the size, color and type of paper each prefers at using the type of pen or pencil that each prefers. Each candidate must submit to the staff of the Commission prior to the debate all such paper and any pens or pencils with which a candidate may wish to take notes during the debate, and the staff of the commission will place such paper, pens, and pencils on the podium, table, or other structure to be used by the candidate in that debate. Unless the Commission has revised its rules since 2004 toward greater leniency, then Romney did violate the terms of the debate.